This Brochure Holder for 4x9 Literature is Stocked for Expedited Shipments. Various Other Pamphlet Display Options Also Available! Includes business card pocket for standard size cards. Single pocket design to display 4x9, tri-fold literature. Crafted from injection molded plastic for a low price point. Wall mounting hole built in for displaying literature on a counter or wall. 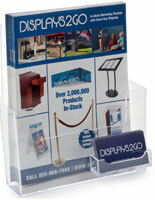 This brochure holder for 4x9 literature is a dual purpose tri-fold leaflet display. Each unit features an angled back design for countertop use, enabling customers to easily see the presented pamphlets. 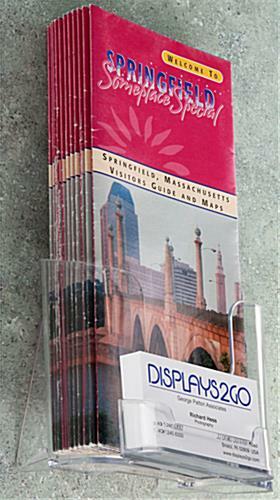 This brochure holder for 4x9 literature that sits on a counter can also be wall mounted as well. The literature dispensers come with a wall mounting hole on the backside, for users to quickly and easily mount these units at eye-level. Each wholesale brochure holder for 4x9 literature is crafted from injection molded plastic for a low price point. This type of material is an affordable alternative to business card or tri-fold dispensers made from acrylic or wood. 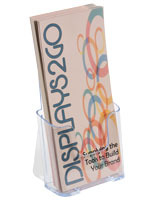 This brochure holder for 4x9 literature that mounts to a wall includes a business card dispenser. The business card area is designed for standard-size cards measuring 3"w x 2-1/2"h. The single pocket brochure holder for 4x9 literature is designed to hold tri-fold pamphlets. These units are often used by various companies, in order to inform potential clients about offered services or products. A retail store might place this brochure older for 4x9 literture that ships assembled at a checkout counter to display layaway information. 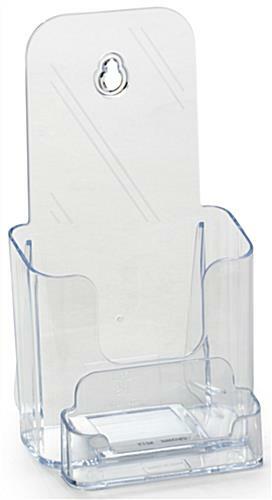 A salon or similar type of business often uses these tri-fold leaflet dispensers to promote various services offered, as well as to present a stylist's business card. Pharmacies and doctor's offices sometimes wall mount these single pocket holders, and present information about individual medicines. 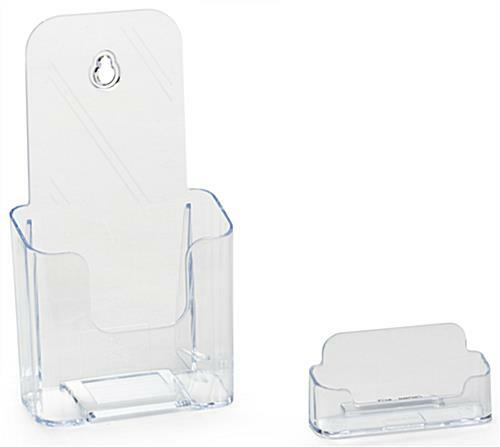 The clear construction of these tri-fold pamphlet holders with business card dispenser enable them to be used within any setting! 4.5" x 7.9" x 4.1"